Try to avoid divergent statements and recursive algorithms. Keep track of memory alignment for reads and writes of large datasets. The 32 threads each calculate their respective idx. The starting point of the for loop is the same as idx. The first conditional statement: all of the threads for which this statement is true (16 threads) will execute, the other threads (16) are idling. The second conditional statement: same as the first, only the other way around. Increase the loop index, and repeat from 3 until the end of the loop. In total we've just executed the same amount of statements as in a serial variant of this algorithm. However, the serial variant does not have any idle time. If you would sum the total time spent executing this algorithm for both variants, the serial algorithm would take less total time than this parallel variant. Simply because half of the threads are idling all the time! By removing the divergent statements, we get code that leaves no thread idling. Of course this was a simple example, and there are many branching statements which are impossible to solve the same way as above. Recapping on point 1: Try to avoid divergent statements and recursive algorithms. It's incredibly easy to make a recursive call which causes divergence in the parallel execution. Keep in mind that the recursive algorithms are just a point of view: if you can guarantee non-divergent recursive calls, there is nothing wrong with recursive calls! The total size of this structure is a simple sum: the amount of floats and integers times their size in bytes. I'm assuming that an integer and float have the same size, because in most compilers they do. With this assumption, in total we have 8 times the size of a float, which is usually 32 bits or 4 bytes. This was measured for a Tesla C2050, which is a bit outdated by now, but by no means a bad statistic to look at. There is a clear trend showing from this graph: the lower the amount of bits read per transaction, the slower memory access speed. 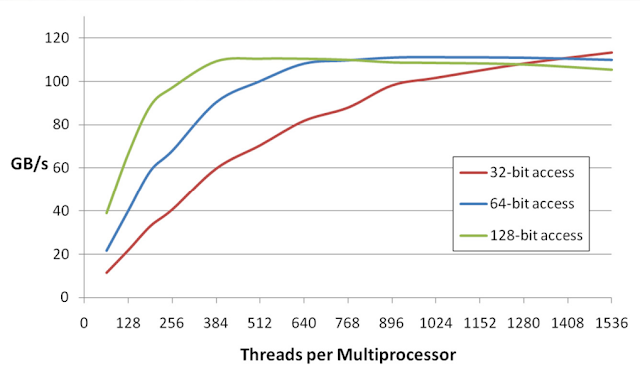 This statement is only true if the amount of threads per multiprocessor is low. This is true in our optimized path tracer, but again, more on this in the next post. Which means the data is now read in as aligned 128 bit reads. Mission successful! Recapping on point 2: Keep track of memory alignment for reads and writes of large datasets. We've successfully read in aligned data on the GPU. 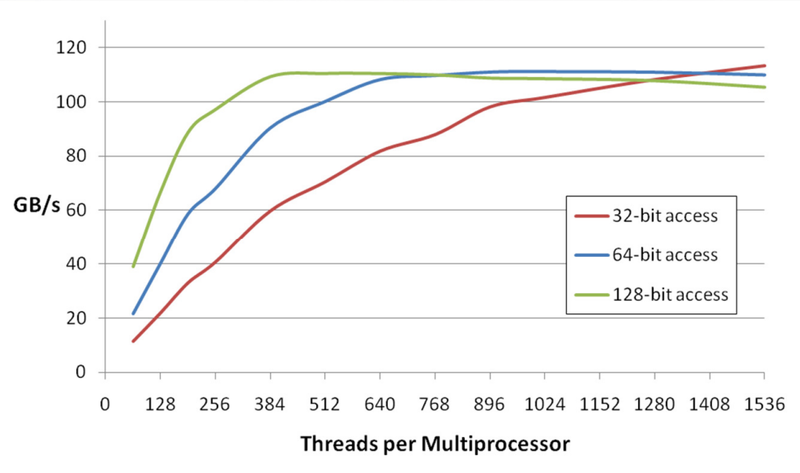 However, there is room for more memory optimization by using data locality. Since this has already become quite a long post, I will postpone this for another time.